A chain stitch is a series of loops that lay on the fabric forming a loose style line. The sample shown in the photo is a close up of part of the leaves and stem sewn on a tee shirt. 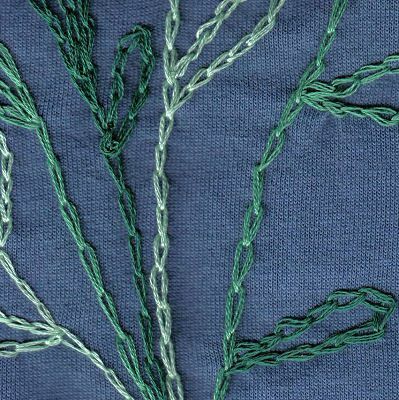 A chain stitch can be sewn with any thread, yarn or ribbon. It could also be sewn on the edge of fused appliqué. Bring the threaded needle from the back side of the fabric to the front of the fabric. Re-insert the needle into the top side of the fabric where it came out of the fabric, pointing out the back side of the fabric. Bring the needle point back up through the right side of the fabric a short distance from where the needle went into the fabric. The distance is a variable which depends on the look you are trying to create. Wrap the thread around the point of the needle as shown in the photo, so that the needle will come through a loop of thread. Pull the needle through the fabric and loop, maintaining the thread loop by not pulling the thread overly tight. To continue chain stitching, insert the needle where it came out of the fabric, pointing down to the wrong side of the fabric. Bring the point of the needle back out of the fabric the same distance you did the first stitch. Loop the thread around the needle point. Pull the needle all the way through the fabric, maintaining the loop by not pulling the thread too tightly. Repeat until you have sewn the desired amount of chain stitches. Insert the point of the needle just on the outside of the thread loop so the thread will cover the end of the loop when it is tightened. Push the needle through to the back side of the fabric. Anchor the thread on the back side of the fabric.